Part of Pasco County, FL, 2 Day Flooring is thrilled to offer our Top Rated Local® Flooring Services to these fine, gregarious residents. 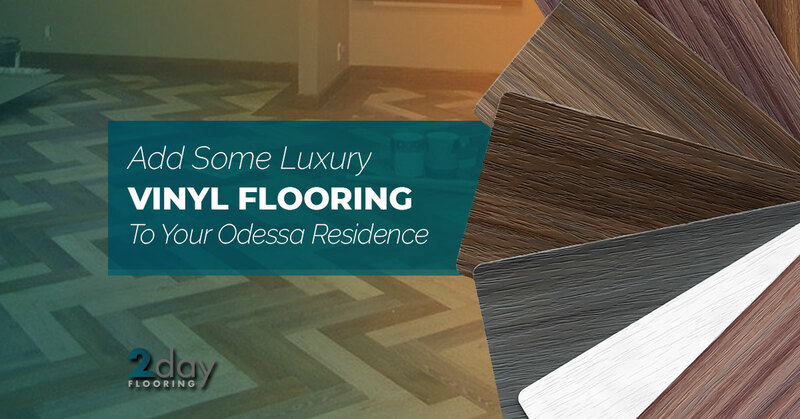 One of the flooring options that we offer for your Odessa residence is luxury vinyl flooring. This beautiful option is perfect for any room in the house because it can handle moisture, sunlight, and scratches. This flooring option is perfect for areas of your home that constantly hear the sounds of feet pitter-pattering or the click-clacking din of heels moving throughout the residence. If you’re considering getting luxury vinyl flooring for your house located in Odessa, then take the time to contact us today and we’ll get started. Luxury vinyl flooring is an option that’s generally skipped over because people don’t realize its potential. This durable and beautiful luxury vinyl option is easy to maintain and clean. It’s great for areas that are high-traffic such as hallways, entryways, even kitchens are a preferred choice for vinyl luxury flooring. When you add this flooring option to your home, you can expect that it can withstand on its own no matter the lifestyle in your Odessa house. When you work with the professionals at 2 Day flooring, you can expect us to install this durable option in a timely manner that doesn’t just look splendid, but it also makes your life a little easier. Don’t worry about high-maintenance flooring options or the proper ways to clean when you install luxury vinyl flooring. Are you looking for a flooring option that’s affordable and looks gorgeous? Luxury vinyl flooring allows you to have the best of both worlds. You can enjoy a heavier wallet while still able to take advantage of the spectacular look of luxury vinyl flooring. After all, there’s a reason this type of flooring is called luxury. With this option, you can take advantage of a variety of different styles that will work with any home. If you’re looking to incorporate a more sophisticated or unique look in your home, then luxury vinyl is the right option. It’s important to note how versatile this flooring truly is. First of all, you don’t have to worry about scratches destroying your flooring. You don’t have to work hard to maintain the floors, and it’s a water resistant surface, so when water falls to the floor, you don’t have to worry too much. What’s great about this flooring is how little you have to work to maintain it; however, like many things in a house, you will have to put some elbow grease in to lengthen the longevity if its life. Why Should You Choose 2 Day Flooring? Flooring made simple, we’re proud to offer the residents an array of flooring services that are preferred. We are the favored flooring service in the Odessa area because we make flooring installation simple. Our dedication, workmanship, and integrity are what drives us to ensure that your flooring looks fantastic. These factors help to ensure that everything from installation to choosing the styles is exactly what you want.